For many people, the best thing that came from the colonial rule was the Indian Railways. Unfortunately I don’t think the colonial rule did anything good because it fundamentally made us believe that our culture and traditions were inferior. The railways would have anyway come to India at some point in time, it didn’t need 200 years of colonization ! Anyway, the Indian Railways plodded along with MASSIVE manpower and the network grew significantly after independence. There were two things that have been a problem all over the country and they also are/were the railways’ biggest problems – timeliness and cleanliness. Along came Mr. Modi in 2014 and spoke of “Swachh Bharat”…. cities started getting cleaned up, waste slowly is being segregated at source, and the Indian Railways is also becoming cleaner. Where earlier you couldn’t stand on the platform without seeing poop on the tracks, today the tracks are clean because most trains have been fitted with bio-toilets. The platforms are cleaner, and many railway stations have escalators and the most recent change that we have noticed which is truly fantastic is ramps instead of stairs. 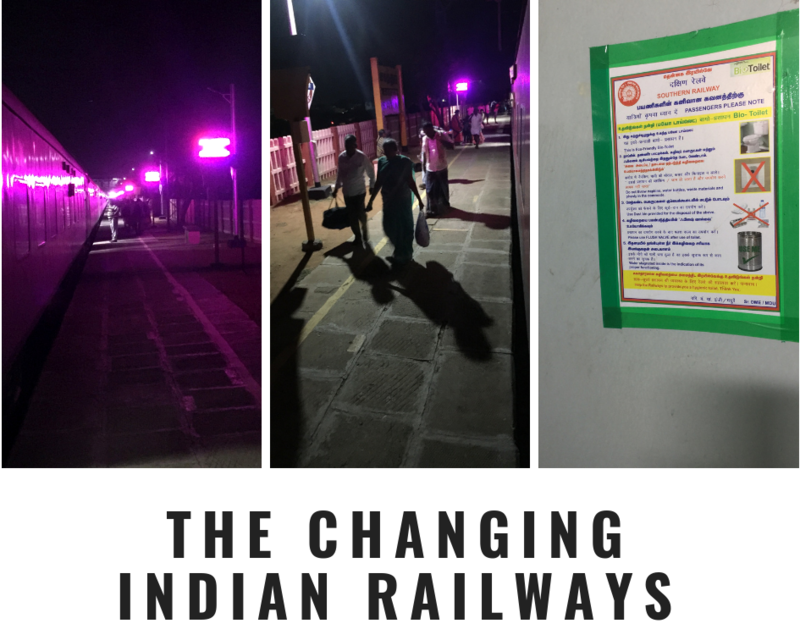 We have taken two train journeys in the past ten days – we went to the Kumbh mela by train and got to see the New Delhi station undergoing a transformation and the “made over” Prayagraj station. 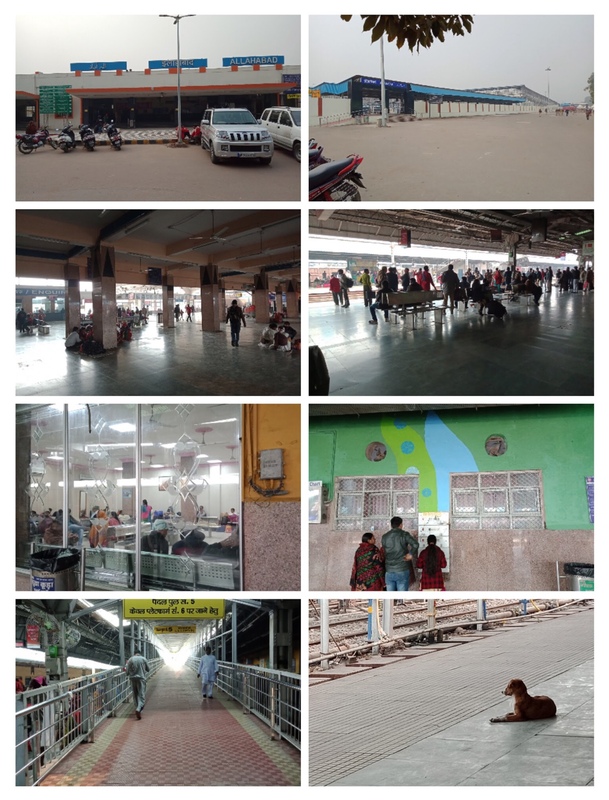 Please see the collage below of the newly transformed Prayagraj junction. The cleanliness was heartening. There are mobile charging stations everywhere just like at the airport and the waiting rooms are well equipped and clean. The tracks are clean inspite of 800 special trains that have been deployed for the Kumbh mela. Last night we took a train from the Egmore Station, Chennai to come to Tirunelveli and the Egmore station was clean with an escalator and ramps. Another good thing we noticed were water stations on all platforms where you could fill up drinking water in your own bottles. They charge just Rs. 8 for a one litre refill. As far as cleanliness of the trains is concerned, the train we took to go to Prayagraj (Poorvotar Express) was an “old” train. The coupe had curtains that had faded and a useless shelf on which you couldn’t keep anything. The toilets were bio-toilets that were non-smelly but not very clean. They were certainly cleaner than average but not upto the mark. The taps were cheap plastic :(. Our return journey was by Jharkhand Sampark Kranti and the 2nd AC compartment was clean and the toilets were really clean. The particular bay where the TTE asked us to shift to, was messy because the previous passengers had strewn things around, but a cleaner came within minutes and cleaned it beautifully. We were so thrilled that we gave him a small tip and he commented saying “people should think of the railway compartment as their property and not litter so much”. Well said and important for the well-to-do educated folks who travel in 2nd AC to remember. Last night the train we took looked brand new and was shining. The toilets had “Jaguar” fittings !!! For the first time in my life I enjoyed brushing my teeth in the compartment of a train. I am ultra finicky about cleanliness and the train compartments don’t have the cleanest of wash basins ! Especially overnight, these get choked or there are all sorts of stains and I almost end up puking just thinking of it. What a relief that those days are gone and I can replace it with this new experience. As far as the second problem of timeliness is concerned – we have had two starkly opposite experiences. The train from New Delhi to Prayagraj was 1.5 hours late and the train from Prayagraj to Delhi (Anand Vihar terminal) was 4 hours late ! We reached back home in the wee hours of the morning around 2.30 am. Even at Prayagraj station, we walked into the station office a few times because we wanted to find out if our train was ever going to arrive. The display board never showed our train and we were concerned because that particular train from Ranchi had a special stop at Prayagraj introduced purely for the Kumbh. Anyway, the good change was the railway officials were helpful, no one ignored us, so customer service is certainly picking up. On every trip I got an automated feedback call about the bedroll or the overall cleanliness. Last night’s train was to start at 8.10 pm and it started exactly at 8.10 pm and reached the Tirunelveli station sharp at 7 am as expected. Not even a minute’s delay. Mr. Piyush Goyal, our rockstar railways minister had mentioned in one of his interviews that they had automatic data loggers implemented to report on the train running timings from April 1st and there has been a steady improvement in the on-time performance of the railways. Here’s a collage of a train station in south India and the bio toilet instructions in Tamil – both the toilets and the platforms are clean. Indian Railways is changing for the good and of course Mr. Modi’s government is accelerating that change !. One more reason to vote him back to the PM’s office in 2019. Many of us don’t realise the far reaching impact of the “Swachh Bharat” campaign. Soon our country will be clean and we no longer need to lament about the “dirty” Indian cities. Ofcourse you do need to do your bit to keep our country clean and not wait for Mr. Modi to come with a broom to sweep the road as some folks are hoping he would.